Keeping your horse in a dirty stall is bad for the horse's hygiene and his longevity. Horses can suffer from assorted health problems if they are left to stand in a dirty stall for days on end. Keeping your horse's stall as clean as possible is crucial, especially if your horse is being kept in the stall 24/7. 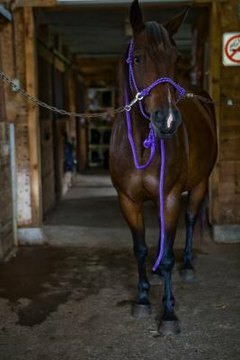 The cleaner your horse stall is the better off your horse will be. Horses were not naturally intended to stand in boxes for hours on end; on the contrary, wild horses roam for miles and graze constantly, rarely staying in a location for long periods of time. Your horse will never benefit from standing in his own urine or feces. Keeping your stalls as clean as you possibly can benefits your horse. Urine contains ammonia. Standing in wet bedding or puddles will weaken the structure of a horse's hooves and can cause lameness problems. Standing in feces generally has the same effect, though not quite as quickly. Most horse people clean an occupied stall at least once a day as a matter of basic hygiene, removing feces and replacing urine-saturated bedding. Some show barns and breeding barns do not turn their horses out; the horses are viewed as investments, and turnout is viewed as a risk. Injured or sick horses may require complete stall rest to encourage healing and prevent the horse from injuring himself. In the case of a horse who can not be turned out, You'll need to clean the stall no less frequently than once every morning and once every evening. Ideally, you'll keep the stall as clean as possible. Remove feces or urine as soon as it appears. If a horse has an open wound, flies and bacteria drawn and caused by the feces can cause additional health problems. You can not clean your stall too often. Cleaning a stall with a horse in it can be a little more challenging than cleaning one without the horse inside. However, it may be necessary if you are in a situation where you can not remove the horse from the stall or if you have nowhere to put the horse while you clean his stall. As long as the horse is respectful of your space, you should not have a problem cleaning around him. Place hay in the corner of the stall where you would like the horse to stand, and start cleaning. Move the horse as necessary. If the horse is a kicker or is otherwise dangerous, remove him from the stall before you clean it. Jessica Jahiel's Horse Sense: Daily Stall-Cleaning or Occasional Stripping?